For centuries the rules for successful participation in the art market remained broadly consistent for collectors but times are changing…and fast…and it is no longer so clear that the old rules apply. The old rules to successful art buying were roughly: – study your subject, buy what you like so you could enjoy it on the wall, buy the best examples that you could afford, seek examples of an artist’s finished work that were obviously within that artist’s normal style and easily recognizable as such, buy pieces in good condition and obtain an independent restorer’s opinion, buy pieces with a solid provenance, take a 10 year view and ignore fashion, if possible only sell from a position of strength, work closely with experienced dealers and auctioneers to benefit from their advice and be generous in transactions to ensure you continued to see the best items first. Now the art market has become more international with new freshly minted collectors emerging from nations that never traditionally collected art. Such buyers want recognizable names and the amount of tradable artists has narrowed to those regularly at auction and on the stands of dealers at fairs. When artists become fashionable, often after they are promoted by a tight group of dealers, auction houses and museum curators, their values can move astonishingly fast such as the currently ‘hot’ Jean-Michel Basquiat who has gone from US$5m to 50m in the last 3 years. Artists outside this small group are virtually unsellable so the major dealers, collectors and auction houses are caught up in pursuing the same artists in a dizzying spiral that pushes prices ever higher. Each year at the major auctions the art market holds its collective breath before letting out a sigh of relief when prices keep increasing and the party for those on the inside continues. The demise of this party has been forecast by many over the last 10 years but the market is still ascending, and, fuelled on a diet of low interest rates and quantitative easing it will continue until the world economy enters its next recession…. at which stage there will be a day of reckoning. The latest fashionable artist, which every collector has to have, is the Italian Lucio Fontana (1899 – 1968) whose recent price increases are almost on par with Basquiat’s. In London’s October sales Fontana’s works cropped everywhere and sold briskly across Frieze Art Fair, Galleries and at the auctions. Out of the 24 paintings by Fontana (or rather canvas’s slashed or holed with his signature markings) offered by Christie’s and Sotheby’s 21 were sold. 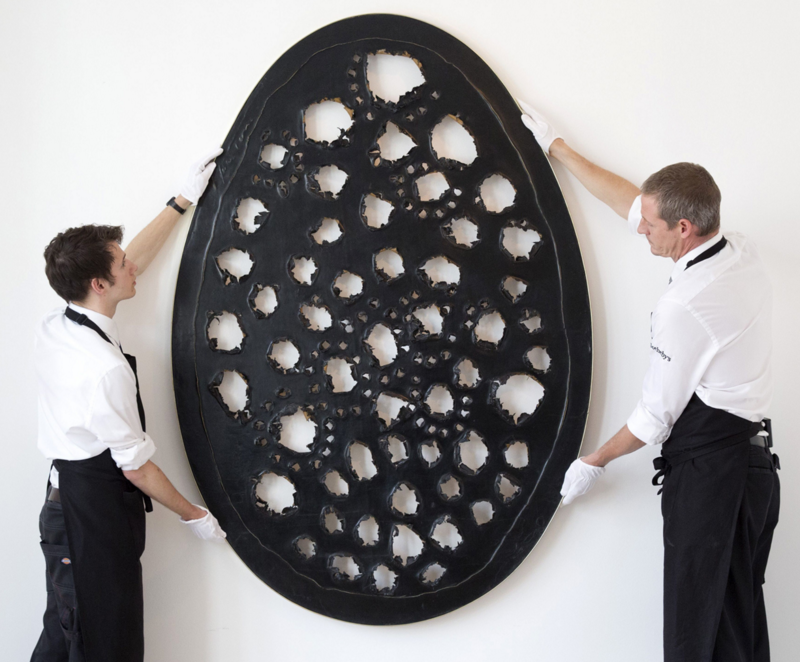 The week’s top lot, Fontana’s egg shaped black canvas, ‘Concetto Spaziale, La Fine di Dio’ sold for 15.9m pounds at Sotheby’s. At Frieze masters, the gallery Dominque Levy said it sold seven paintings by Fontana. Italy’s Tornabuoni Art gallery opened its new London branch this month with a Fontana exhibition. The 55 artworks on view are apparently valued at US$136 million. “I didn’t know there would be this invasion,” said Ursula Casamonti (whose family owns the gallery), each time we open a new branch, we open with Fontana.” The gallery sold a large 1965 slashed white canvas that had had an asking price of 14 million euros. 5 years ago a good example of Fontana’s work was around US$2m. This is a wild market with the majority of collectors enjoying this momentum collecting. The old rules of collecting seem rather antiquated and boring to this new breed of collectors and it is clearly more exciting to jump on this tiger and ride it than to think long-term and buy quality irrespective of fashion. Fontana was an original artist and he has his place in the history of 20th century art. Was he a genius and worthy of being valued in the rarefied pantheon of the most valuable artists ever to have walked the earth? The current market thinks so but this writer has his doubts. The trouble with following fashion is that fashion changes. In the meantime enjoy the ride as long as it lasts.